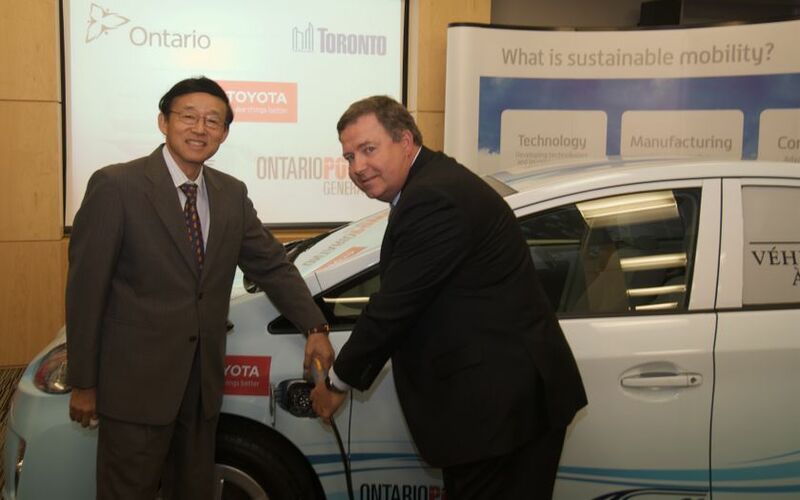 (Toronto, ON) - August 24, 2010 - A new era in sustainable mobility begins in Ontario, as Toyota Canada delivered a Toyota Prius Plug-In Hybrid (Prius PHV) to its provincial testing partners at a ceremony today. 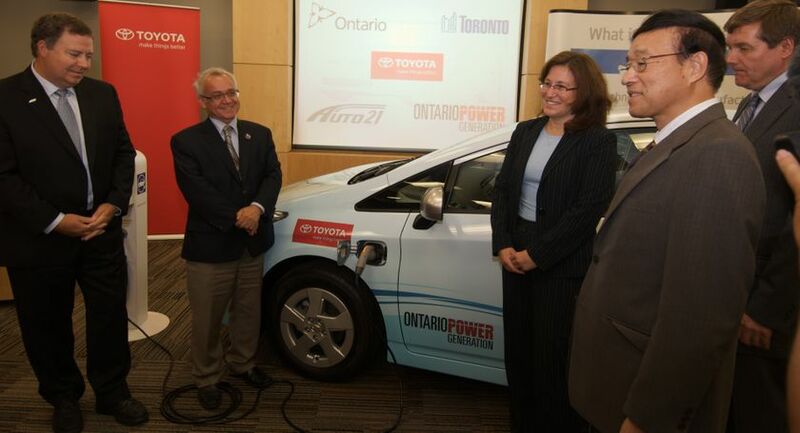 Toyota Canada and provincial partners the Province of Ontario (Ministry of Energy, Ministry of Transportation), Ontario Power Generation, the City of Toronto and the AUTO21 Network of Centres of Excellence were all on hand to officially ‘plug-in’ to the future. To mark the occasion, Rick Jennings, Assistant Deputy Minister, Energy Supply, Transmission and Distribution Policy, Cara Clairman, Vice President of Sustainable Development, Ontario Power Generation, Joe Pantalone, Deputy Mayor, City of Toronto, Dr. Peter Frise, Scientific Director and CEO, AUTO21 Network of Centres of Excellence and Toyota Canada’s President Yoichi Tomihara were on hand for the delivery at Toyota Canada’s head office in Scarborough today. "Participating in a program like this supports the City of Toronto's Green Fleet Plan and Sustainable Energy Plan actions, to pilot test promising vehicle technologies including electric vehicles like the PHV and incorporate them into the City's fleet." Gerry Pietschmann, Director of Fleet Services, City of Toronto. Toyota’s Ontario partners will share their Prius PHV, which will be fitted with telematics equipment to record vehicle and hybrid system performance. Based on the world’s most popular hybrid vehicle, the Toyota Prius PHV is designed to deliver a range of more than 20 kilometres and top speed of almost 100 KPH on battery alone. In addition, an onboard Atkinson-cycle gasoline engine enables the vehicle to revert to hybrid mode and operate like a regular Prius - giving the vehicle the driving range and performance Canadians demand from today’s automobiles. The Toyota Prius Plug-In achieves a fuel consumption of just 1.75L/100km and CO2emissions of 41 g/km under specified driving conditions (combined electric vehicle and hybrid vehicle modes). Compared to the typical conventional midsize automobile, driving a Prius PHV for one year is expected to reduce one’s fuel consumption by 1,650 L (83%) and one’s CO2 emissions by almost 4,000 kg (or 4 tonnes). Canada has been selected as one of the participating countries for Toyota’s global test of the Prius PHV. 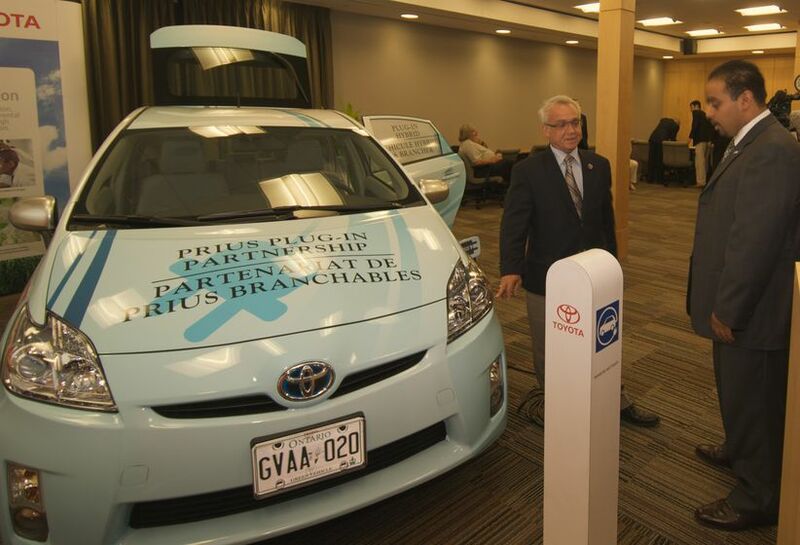 Five Prius PHV vehicles hit the roads this summer with 15 trial partners in 4 provinces in the first phase of a nationwide trial, including Ontario. This enables Toyota Canada to conduct technical and market acceptance tests unique to Canada’s driving experiences and climatic conditions. The real world trials will continue through the coming winter to assess Prius PHV performance under a range of driving and climate conditions. Moreover, feedback from the Canadian tests will help ensure the Prius PHV performs well in any country where drivers encounter cold temperatures, ice and snow. Canadian Prius enthusiasts are encouraged to join Toyota Canada’s Prius PHV facebook page for information on consumer test-drive event opportunities, telematics feedback updates from the test trials, and details on Toyota’s sustainable mobility efforts (http://www.facebook.com/ToyotaCanadaPriusPlugIn). Toyota Canada Inc. (TCI) is the exclusive Canadian distributor of Toyota and Lexus cars, SUVs and trucks, and Toyota Industrial Equipment. TCI’s head office is in Toronto, with regional offices in Vancouver, Calgary, Montreal and Halifax and parts distribution centres in Toronto and Vancouver. TCI supports more than 300 Toyota, Lexus and Toyota Industrial Equipment dealers in Canada with services that include training, marketing and environmental and customer satisfaction initiatives. A consistent award winner for product quality and ownership satisfaction, Toyota has sold over three million vehicles in Canada. For more details, including a full list of Toyota Canada media contacts, digital images and product details please visit media.toyota.ca. For more information about plug-in electric vehicles in Ontario, please visitwww.plugndriveontario.ca. For more information on the City of Toronto's green vehicle programs, please visitwww.toronto.ca/fleet. For more information on the AUTO21 Network of Centres of Excellence, please visitwww.auto21.ca. Fuel consumption is an estimate based on the Japan JC-08 test. Fuel savings and emissions reductions claims are based on a comparison with the average fuel consumption of all midsize vehicles listed in Natural Resources Canada’s (NRCAN) Fuel Consumption Guide, assuming yearly average driving distances of 20,000 km/year. 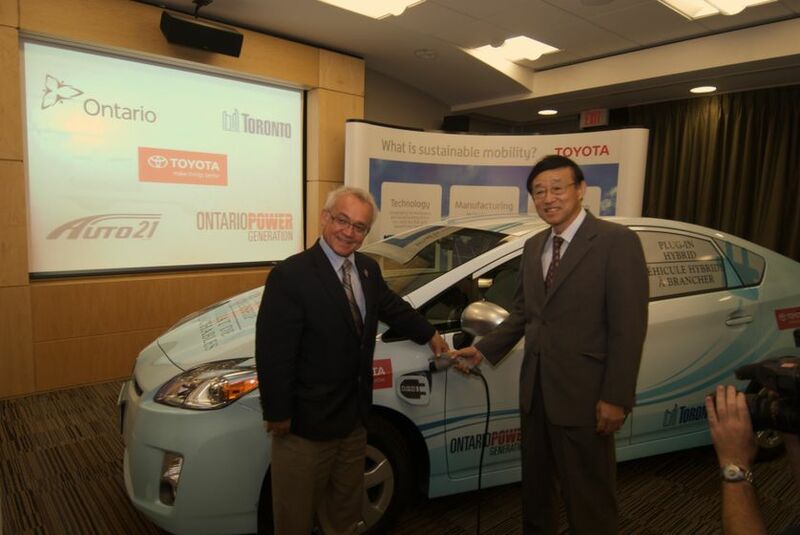 (L-R) Joe Pantalone, Deputy Mayor, City of Toronto and and Toyota Canada’s President Yoichi Tomihara were on hand for the delivery at Toyota Canada’s head office in Scarborough.